All transactions are safe and secure with a reliable history in online purchasing behind each of our associates. 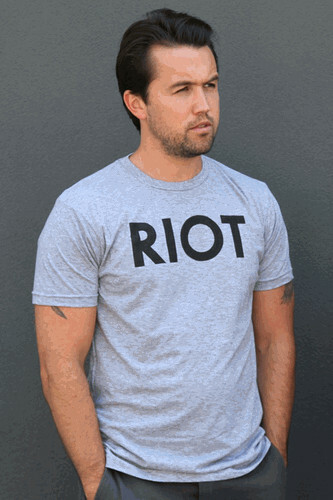 Buy the It's Always Sunny Mac Riot t-shirt to own It's Always Sunny in Philadelphia clothing and merchandise. Frank, Denny, Dee, Charlie and Mac...the entire It's Always Sunny in Philadelphia cast is definitely a riot. Not only does Mac's Riot t-shirt shown here support this notion, it also matches his disruptive personality. Now you have the opportunity to start a riot with this official limited edition Mac clothing item. Wear it as you enjoy the current season or get pumped up on reruns. We don't advise spewing lies or insults at everyone like Mac, only if it's the McPoyles. Show off your excitement for this It's Always Sunny t-shirt but try not to start a riot. In addition to the It's Always Sunny Mac Riot tee above, browse the It's Always Sunny in Philadelphia Clothing Gallery for more apparel like men's and women's clothes, kids shirts or hoodies.